Heat oven to 425°F. Lightly grease 15x10x1-inch pan with shortening or cooking spray. Sprinkle with cornmeal, tapping off any excess. In large bowl, stir Bisquick mix and yeast. Add water; stir until dough leaves side of bowl. On work surface dusted with additional Bisquick mix, lightly knead dough 1 minute. Roll out to 15x10-inch rectangle. Place dough in pan; crimp edges, forming a rim. Spread pesto over dough. 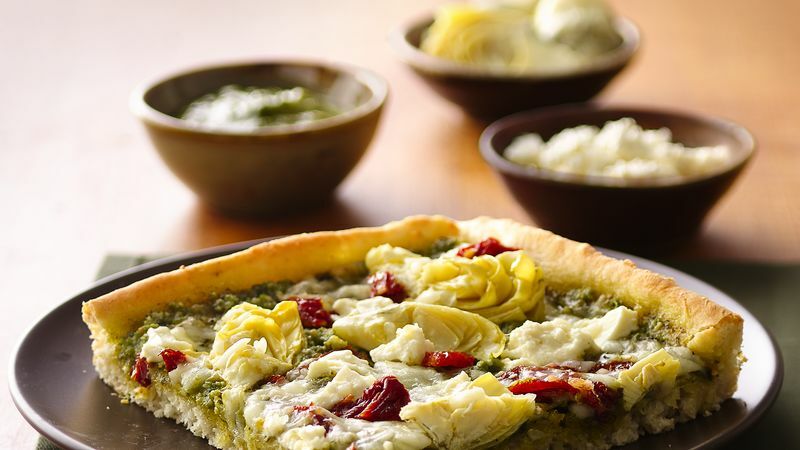 Sprinkle tomatoes, artichokes, mozzarella cheese and feta cheese evenly over top. Bake 12 to 15 minutes or until cheese is melted and crust is golden brown. Look for basil pesto in glass jars in the pasta aisle or in the refrigerated pasta section in plastic containers. If you’re an olive fan, top the pizza with sliced ripe olives or Greek olives to continue the Mediterranean theme. Garnish with chopped fresh basil after baking to add more color to this pizza.